Betty Jane Evans Chatham, daughter of Bert Calvin Evans and Ona Henderson, married to Howard Eugene Chatham and buried in Elmwood Memorial Park Cemetery, Abilene, Taylor County, Texas. 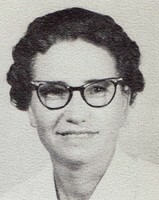 Lawn Independent School District Cafeteria Custodian (1956-1957). Jim Ned Consolidated Independent School District First Group of Custodians (1957-1960). Betty Jane Chatham, 92 of Burleson, formally of Abilene, passed away Saturday, December 19th in Burleson. Funeral services will be 11:00 A.M. Tuesday, December 22 at Westgate Church of Christ with Rodney Ashlock, Luke Jackson & Mark Jackson officiating. Burial will follow in the Elmwood Memorial Park Cemetery. Betty was born to the late Bert & Ona Evans on August 7, 1923 in Burkett, Texas. She married Howard Chatham in April of 1941 in Baird, TX. She was a member of the Westgate United Church of Christ. Betty is preceded in death by her parents, husband; Howard Chatham, one daughter; Sharon Paige and one granddaughter, Shelley. Betty is survived by one son, William Chatham of Abilene. Daughter; Connie Jackson & husband Mark of Burleson. One sister, Joan Burton of Abilene. Five grandchildren; Donny Skiles, Todd Skiles, Jill Paige, Luke Jackson & Brady Jackson. Fourteen Great-grandchildren & numerous nieces, nephews other relatives and friends. Arrangements by The Hamil Family Funeral Home, Abilene.